You can quantize, or automatically correct, the timing of notes in the Score Editor. This technique is useful when regions in the track contain the right notes, but are not perfectly in time with the project. When you quantize the timing, items are adjusted to the selected note value. You can select and quantize complete MIDI regions, or quantize only selected notes in a MIDI region, using the Time Quantize pop-up menu. Time quantization works nondestructively, for playback only. The original timing is never lost, and can be recalled by setting the value to off. Time quantization in the Score Editor works in the same way as time quantization in the Piano Roll Editor. In the Score Editor, you can also visually quantize the display of notes (independent of their MIDI time quantization) using the Grid pop-up menu. In the Tracks area, select the MIDI regions you want to quantize. 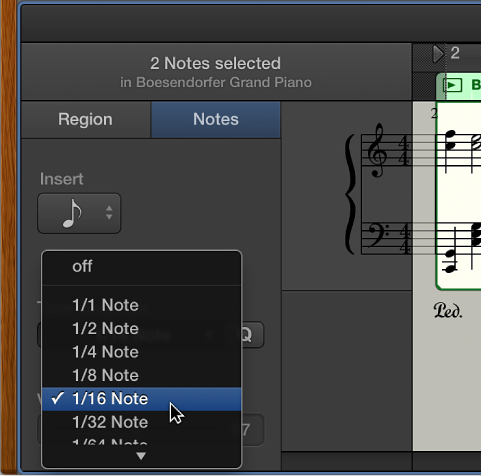 In the Score Editor, select the individual notes you want to quantize. From the Time Quantize pop-up menu, choose the note value you want to use to quantize the timing of the selected items. Drag the Strength slider to the left to decrease the strength of quantization. The Strength slider is available when MIDI regions are selected, but not when individual notes are selected.